Taj Gibson usually sits next to Derrick Rose on the Bulls bench. The fourth quarter was about to begin Friday, and though the Bulls had worked back from an 18-point halftime deficit to the Detroit Pistons, they still trailed by 10 and were being hammered on the backboards with Andre Drummond on the way to a game of 26 points and 26 rebounds. It was something of an epiphany for Gibson, but also a realization of what the Bulls have been and perhaps what they can become. Noah became the ninth player in NBA history with at least 400 assists and 100 blocks, joining Kareem Abdul-Jabbar, Kevin Garnett, Sam Lacey, Alex English, Alvan Adams, Dwyane Wade, Michael Jordan and Scottie Pippen. And beyond as the Bulls, led by Gibson and D.J. Augustin—whom coach Tom Thibodeau called the team’s “most efficient scorers”—totaling a combined 23 fourth quarter points, rumbled by the misfiring Pistons for a 106-98 victory. There may be a lot more believers trying to get on that wagon given the sweet string music this group of Bulls has been playing. 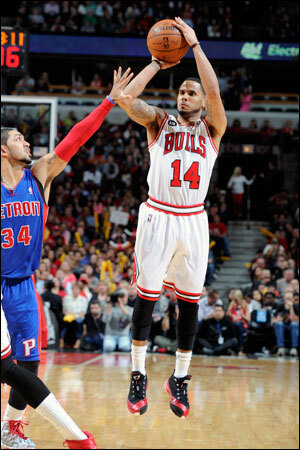 With the victory, their seventh straight, the Bulls are 47-32. They have the best record in the Eastern Conference since January 1 and the most wins. If the season started this way, critics might be talking title. No one is quite yet, and certainly not these one-day-at-a-time energizer vitamin players. But the Bulls did move into third in the Eastern Conference ahead of Toronto, potentially setting up a playoff bracket without the Heat and Nets, considered the dangerous teams in the Eastern Conference. That’s all still to be settled. But more than any other team in the conference, the Bulls are playing at a consistently high level. Slowly, but inevitably to the surprise of most, the Bulls have become not only an efficient and high scoring offense, but a dominant fourth quarter team. This for the team last in scoring most of the season. That was then; they can score now. This is the fifth game in the last seven the Bulls have scored more than 100 points, averaging 101 in this seven-game winning streak. They again had six players in double figures with only Joakim Noah among their now Magnificent Seven failing to score in double figures. Noah did have 12 rebounds and 10 assists and added yet another milestone to a season in which he’s almost certain to be among the top five in league MVP voting. Noah became the ninth player in NBA history with at least 400 assists and 100 blocks, joining Kareem Abdul-Jabbar, Kevin Garnett, Sam Lacey, Alex English, Alvan Adams, Dwyane Wade, Michael Jordan and Scottie Pippen. It is another of those questionable sorts of records, however, as the NBA didn’t count blocks before the 1973-74 season when the greatest shot blockers in history, Wilt Chamberlain and Bill Russell, played. But it’s also been an uncommon kind of season for the Bulls with the loss of both Rose and Luol Deng. Yet it now exhibits this extraordinary close to the season and a quiet promise of greatness with Indiana and Miami stumbling to the close. No one’s accomplished that quite like the Bulls, and as Gibson suggested, it is starting to feel like other seasons when the winning came in bigger bunches. It wasn’t a brilliant effort Friday as the Pistons are 29-51. But you let a team out of the playoffs get going and you can be a loser quickly. It happens plenty late in the season with the guys out of it free flowing and making shots and perhaps with something to play for you end up playing a bit too carefully. It seemed that way to start as the Pistons took a 10-3 lead and 28-17 after one quarter. “That was a concern right from the start,” Thibodeau said about Detroit on the boards as Drummond alone had 19 by halftime and the Bulls had 17 as a team. Drummond was dominant on the defensive boards, curtailing the Bulls usually aggressive second chance play. And guard Rodney Stuckey was bulling his way to the basket on the way to 22 points. The close of the season also can be curious with these non playoff teams. It did appear the Pistons were trying to win the game. But they are one of those teams with the unusual draft situation. They surrender their draft pick to Charlotte unless they are in the bottom seven. They are currently eighth. Drummond did go out for a vital stretch in the fourth quarter, though he did play 42 minutes. But Stuckey played just 31. Of course, Augustin played 28 and Gibson 27. And the Bulls were playing to win. 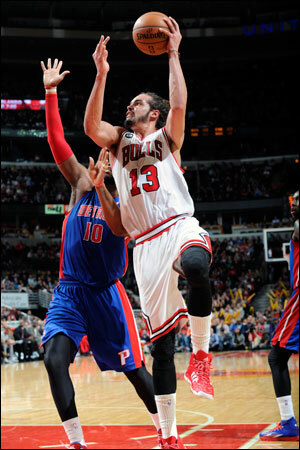 But Pistons interim coach John Loyer made a trenchant observation about the Bulls. And Loyer noted it’s becoming a lot more difficult to hold on down the stretch against the Bulls for a variety of reasons. Though the meal would come later, as well as the 100-point Big Macs for the hungry audience. Drummond continued to dominate the rebounding and the five Bulls starters had just 16 points combined at halftime in trailing 56-38. No panic; what them worry? “Overall, I thought we showed a lot of resiliency. Good word, eh?” Noah asked playfully. It’s become a confident group; not arrogant and not reading their media reports. Instead, it’s a team in the fullest sense with offense coming from opportunity and everywhere, making them more difficult to defend. On defense it’s the usual energy, emotion, enterprise and ethic. The Bulls came back in the third quarter with 32 points on 59 percent shooting as Carlos Boozer and Mike Dunleavy made shots, the ball “hopping, as Thibodeau likes to say, and Kirk Hinrich with several jumpers after crossover moves and spins that had fans seeing visions of that Kansas comet of a decade or so ago. It’s been a winning formula that has made all seven offensive options with what scouts following the Bulls have called the best ball and player movement in the conference. Hinrich, meanwhile, is averaging 15.2 points this month and shooting an impressive 47 percent on threes since the All-Star break with every regular averaging in double figures the last two months. Heck, the offense has been so impressive even Thibodeau liked it. It’s the winning formula, and this time it was Gibson and Augustin. It’s been the beauty of the Seven. They’re not quite the 70’s Knicks with offense coming from every starter, the Phil Jackson ultimate model. Phil, obviously, won the other way, with the scoring stars. These Bulls don’t have those guys. So they actually play a purer form of the game: Go to who has the favorable matchup, shoot if the ball comes to you, everyone able, everyone ready and willing. It felt like ’11 again as Jimmy Butler with 13 and his routine 44 minutes opened with a jumper, Dunleavy added a three, and then Gibson absolutely took over the game with a searing aggression that stunned the Pistons. It was a stunning five-minute sequence when the Bulls went from trailing 83-75 to leading 92-86 with then about five minutes left in the game. Gibson blocked a Kyle Singler jump shot leading to an Augustin 20 footer and then blocked Jonas Jerebko also on a jumper as he tried to maneuver inside and fade away. Gibson then ran out on a Pistons miss with Augustin pushing and Gibson finishing for a three-point play and then a powerful slam dunk in traffic after Noah grabbed a miss. Augustin added a pretty ball fake and reverse layup, and then Gibson produced yet another of those angry slam dunks with Pistons scattering like bowling pins. It gave the Bulls a 100-90 lead with 2:26 left and the Bulls on the way to their 21st win in the last 23 against Detroit and third place in the Eastern Conference. Just another place for this surprising group to continue to bloom.